"Beam me up." Sure, you've always said it with a smile when talking Trek, but it took on a whole new meaning when you put on a Starfleet costume for the first time. Wearing the iconic uniform of the United Federation of Planets meant you could pretend to be a bold Starfleet officer, and you probably felt like you could really contact the USS Enterprise and get beamed out of any and every situation you found yourself in. Contingent on one thing though: having a com-badge on your chest. We all know the iconic gesture of tapping your chest, and instantly being able to communicate with any member of the crew on Star Trek The Next Generation (and subsequent series). 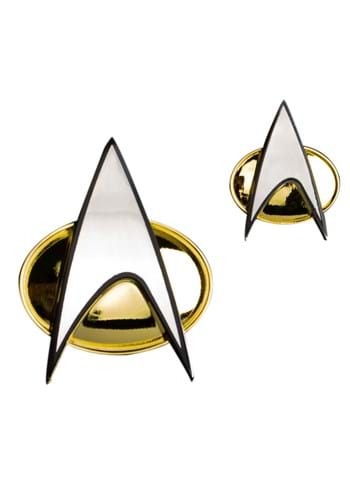 Now, you can make sure your Star Trek costume is ready for real Starfleet duty with this replica badge! You can dress up as Captain Picard or Dr. Beverly Crusher, or any of your other favorite characters. Or you can be your own new addition to the Enterprise crew! This accessory features the signature logo from The Next Generation, and it's ready to go on your chest to make you a part of the crew. Now, go ahead, say it with us: "Beam me up!"